Jahangirnagar University Admission Test Circular 2017-2018 has been published. 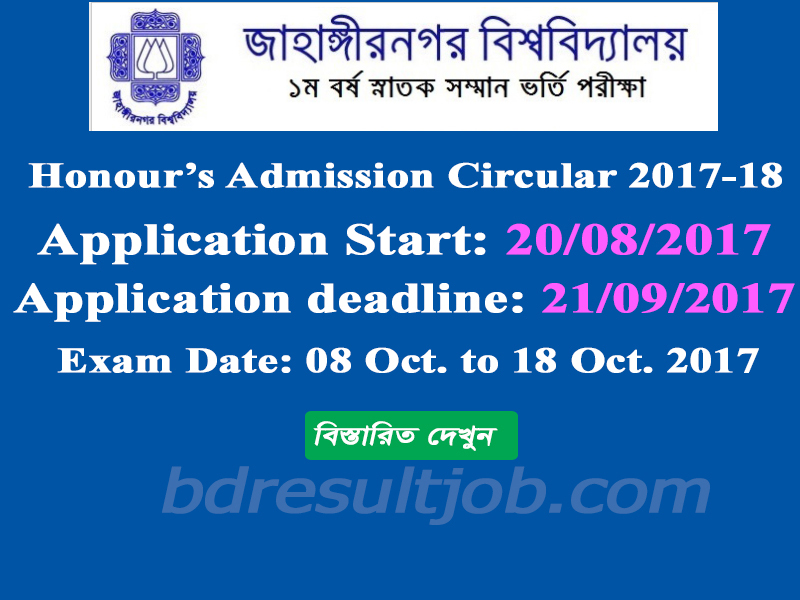 Jahangirnagar University Admission Test Circular 2017-2018 has been published. Jahangirnagar University Admission Test Circular 2017-18 20 August to 21 September, 2017. 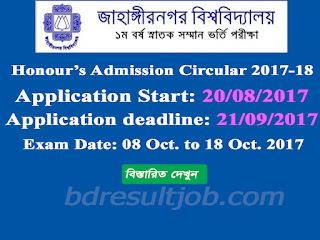 Jahangirnagar University Admission Test Circular 2017-18 and Admission related all information will be found in JU Official website at https://www.ju-admission.org/ & our website www.bdresultjob.com as well. b. Please see details admission notice. 1. Please prepare a color Photograph (Dimension 300x300 pixel less 100KB) and signature (Dimension 300x80 pixel less 60KB). 2. Visit: https://www.ju-admission.org/ and fill up application form carefully. 3. Print the appliac tion form and note down the biller ID. 4. Complete the payment in DBBL mobile Banking. b. Select 1 for payment. c. Select 1 for Bill Pay. d. Type the Biller ID 343 for Jahangirnagar University. e. Type the Bill Number. g. Input your PIN number and Complete the payment. Every applicant Jahangirnanagar University admit card can download until 30/09/2017. i. Please prepare a color Photograph (Dimension 300x300 pixel less 100KB) and signature (Dimension 300x80 pixel less 60KB). ii. Visit: Admit Card Download and select the admit card menu. iii. Login with Bill Number and DBBL Transaction ID. iv. Upload your photo and signature. v. Download your admit card and print it. vi. If you apply for more, then each unit will have to collect the admit card separately. Tags: ju admission org. ju-admission org. www ju admission org. www ju-admission org. ju admit card. ju ac bd. ju admission. ju seat plan. www ju ac bd. ju admit card download 2016-17. ju admit card download. www juadmission org. ju_admission org. ju admit. juadmission org. ju admission seat plan. ju- admission org. ju teletalk com bd. ju admit card 2016. ju addmission org. Bangladesh Education and Job Portal: Jahangirnagar University Admission Test Circular 2017-2018 has been published.